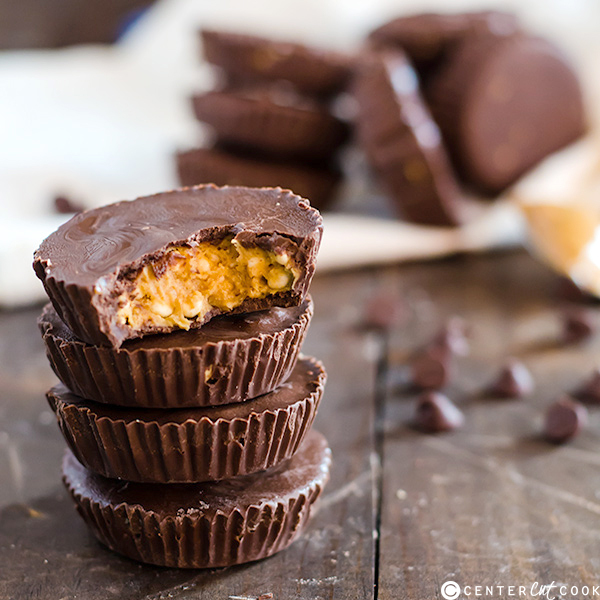 Peanut butter cups got even better with the addition of a light and airy crunch in the filling. This delicious no-bake candy treat is sure to be a new favorite! Confession: I am addicted to peanut butter cups. I just cannot get enough of them. Once I had a 5 lbs peanut butter cup I got from a novelty store and kept it in my freezer to munch on all summer long. My only regret was not buying two! I spent a long time trying to mimic that delicious classic peanut butter cup flavor, but then I realized that it just wasn’t enough for me and I needed to give them a tiny bit of an upgrade. What I found I needed was a bit of texture. 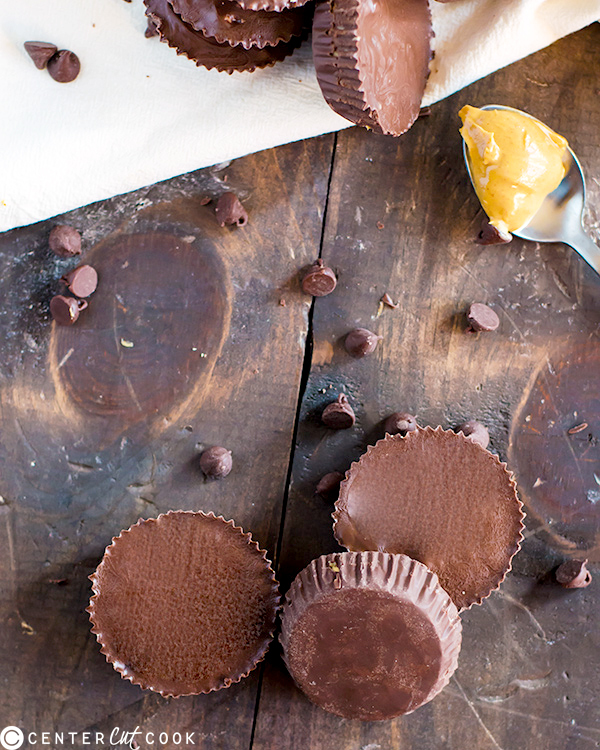 I love a bit of crunch and as it turns out, it goes great in peanut butter cups! Peanuts seemed to be a bit much and left you chewing for too long, so instead I used a puffed rice cereal. It adds the perfect amount of crisp without bring overbearing. I love using puffed rice cereal as it is in the recipe to make it a true no-bake recipe, but you can also toast the cereal in the oven for a few minutes to give it an extra crunch when you bite down. It is completely up to you! I also discovered the trick to getting a smoother top to my homemade peanut butter cups. Before I would always end up with lots of swirls on top which were pretty, but not very polished. All you need to do is shake the muffin tin on your surface a few times and the chocolate will even out for a nice and smooth top. I don’t know why I never thought to do it before! These delicious no-bake peanut butter cups make an excellent snack to keep in the refrigerator or freezer for late night munching, but they are even better when you share with friends! Optionally preheat the oven to 300 degrees F and place cereal on a baking sheet. Bake for 10 minutes. This step is recommended for added crispiness, but is NOT required. Mix together the peanut butter, butter, salt, and powdered sugar together until light and creamy. Fold in the cereal. Place the chocolate in a microwave safe bowl and heat in the microwave at 50% power for 30 seconds. Take out and stir. Repeat this process until the chocolate is completely melted. Place cupcake liners in a muffin tin and drop a teaspoon of the melted chocolate on the bottoms of each liner. Spread the chocolate across the bottom and push up slightly around the edges. Allow to harden. Place 2 teaspoons of the peanut butter filling on the center of the bottoms of each liner and gently smooth and spread out until it is nearly at the edges. Leave a small border for the chocolate to coat the edges. Place roughly 2 teaspoons of chocolate over the peanut butter mixture. Push the chocolate to the edges and ensure the peanut butter is completely covered.